VACATION INFORMATION – Why Would Anyone Visit Molokai? Heck of a good question. Most folks who visit Hawaii come for the glitz, glamour and tourist-centered activities that a tropical vacation destination offers. Many visitors are drawn to the bright lights, fancy restaurants and busy beaches of Waikiki or to the West Maui mega resorts near Lahaina and Ka’anapali Beach. Others find their way to resorts on Kauai or the Big Island, Hawaii. All of these destinations offer paradise; warm sandy beaches, the blue Pacific Ocean and nearly perfect weather, all hermetically packaged for the visitor from the US Mainland or Japan. Very few of these visitors ever hear of the little island anchored between Oahu, where bustling Honolulu is, and Maui the busiest tourist island in Hawaii. From the typical traveler’s perception, that is true, there’s nothing here. There are no mega resorts. No five-star dining opportunities. No tourist-packed beaches. No shopping malls. Basically none of the things that make other Hawaii destinations soooo commercial. What Molokai does have are precious resources that are shared with the few lucky visitors and protected by residents who refuse to allow this beautiful island to go the way of the other tourist-driven islands. Molokai is a place where aloha is a lifestyle, not something put on for the tourists. You see it every day on smiling faces on the streets of Kaunakakai, the island’s largest town and in the smaller villages around the island. You hear it and feel it, provided your heart and mind are not clouded by the harshness and hurry of life in your hometown. If you come to Molokai to become part of what is here, you will be overwhelmed by the aloha and spirituality. If you bring your demands and lifestyle attitudes, you will be disappointed and will probably not find the island to your liking. There is so little traffic on Molokai that there is not even a single traffic light. An occasional row of 3 or 4 cars constitute a traffic jam and that doesn’t seem to upset anyone, there’s no rush to be someplace else. Visitors stay at one of the five condominium projects, in a beach cottage or at the island’s one hotel, all of which offer accommodations at very reasonable-for-Hawaii prices. The restaurant choices are mainly located in Kaunakakai and while there are no 4 or 5-star dining opportunities, you will be able to find good food and ambiance from picnic tables to beachfront dining. Folks who choose condominium or beach house accommodations can acquire groceries at either of the grocery stores in Kaunakakai or one of the markets in Kualapuu or Maunaloa. Even the largest of these stores will seem petite by mainland standards. Because everything is brought into Molokai on a barge from Oahu, the prices will seem a little high, especially for packaged or frozen goods. Choices in all things are limited, so you may not find “your” brand of a product or “your favorite” produce item. Time to simplify. 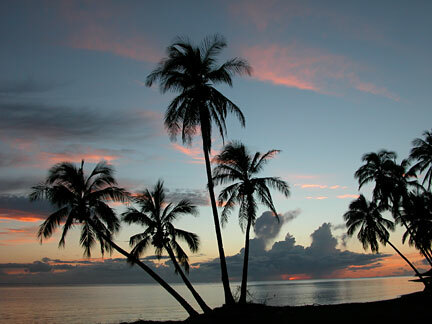 Remember, you can find everything you “need” on Molokai. However some of your “wants” may go unmet. So… Why would anyone visit Molokai? To find the real Hawaii, the Hawaii of 50 years ago. If you need to be entertained while vacationing on Molokai, there are a few choices. Golfers can play nine or 18 at the delightful Ironwood Hills municipal course in Kalae. There are many empty or almost-vacant beaches, many of which are safe for snorkeling or swimming. Some of which are only safe for shelling or strolling. There are a couple of sport fishing boats to take you out to the blue to catch dinner. You can go snorkeling or scuba diving at the reef’s edge on a dive boat. Ocean kayak trips on top of the south shore’s fringing reef can be arranged. Ride the mules or hike down to the Kalaupapa settlement for the tour of Father Damien’s ministry. If you can entertain yourself, you will find abundant opportunities. Watch a hula halau (school) practice. Watch for Humpback Whales when they visit between December and April. Visit the Saturday morning market to shop for fresh island produce. Go for a swim at the Cooke Memorial Pool. Take a trip to Kalae for a visit to the Phallic Rock and a view of Kalaupapa from the look out. Picnic in cool Pala’au State Park. Watch the paddlers practice their outrigger canoe strokes at the wharf or go to a Saturday canoe race in the summer.